Minecraft. It’s everywhere you look. The game about placing blocks and going on adventures remains a worldwide phenomenon and can be found on every device that you own. Well, nearly. And, where Minecraft: Wii U Edition had landed quite late in the console’s life, Mojang and 4J Studios have moved swiftly to see Minecraft: Nintendo Switch Edition become an early star attraction on the portable home console. It needs no introduction at this point, placing players in a procedurally generated world where they are free to spend their time however they wish. That, more often than not, results in building something at some point, stirring otherwise dormant creativity in players of all ages as they look to bring whatever their imagination can conjure to life. 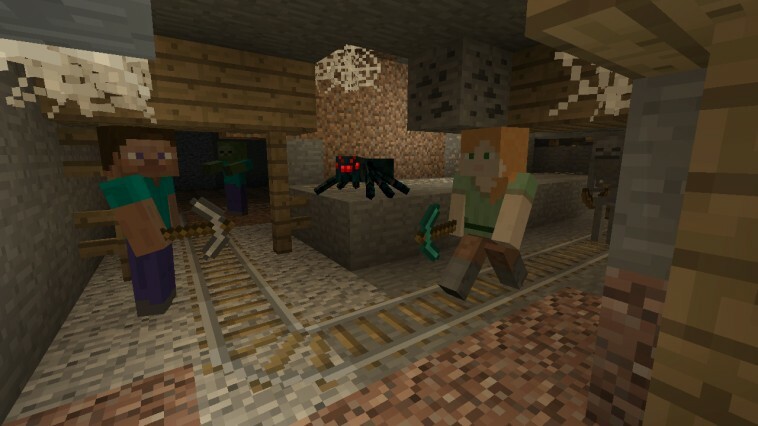 There are two main modes to choose between: the more relaxed Creative Mode where players needn’t fret about resource gathering and build to their heart’s content; and Survival Mode, in which the player must collect everything that they need while being under the constant threat to hide in a shelter at night to hide from monsters. There’s nothing that beats the thrill of seeing the sunset only to realise that you are miles away from the shelter that you carefully constructed earlier in the day, resorting to sealing yourself in a newly discovered cavern only to panic when you realise that there’s a Zombie behind you. It’s those unpredictable moments that can create many long-lasting memories with Minecraft: Nintendo Switch Edition. But, if you would rather spend your time building that majestic castle or dream home, then many will equally admire your intense planning, hard work and dedication. It won’t be a surprise that this is an experience that is best shared, and, on Nintendo Switch, up to eight players can explore and build together online, while there is support for up to four players in local multiplayer – whether that be in TV or Tabletop mode. For those less familiar with the exploration, resource gathering, crafting, and combat churn, a short tutorial can teach you to basics so that you are relatively up to speed – perfectly suited to newcomers or parents that want to see what their children are so enthusiastic about. Minecraft: Nintendo Switch Edition compares favourably to Minecraft: Wii U Edition, too. While the Wii U Edition only supports the Classic world size, the Nintendo Switch Edition has wider support for Classic (864×864 blocks), Small (1024×1024 blocks) and Medium (3072×3072 blocks). That means larger areas to explore and build in, with the only omission being the Large (5120×5120 blocks) world size – which, on consoles, is only available in Minecraft: PlayStation 4 Edition and Minecraft: Xbox One Edition. 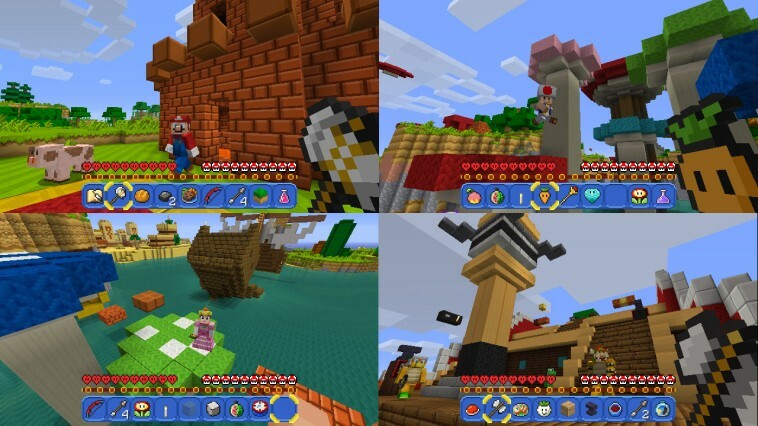 Then, there’s the Super Mario Mash-Up Pack that, unsurprisingly, remains exclusive to Nintendo platforms and comes included with Minecraft: Nintendo Switch Edition. This has 40 Super Mario-themed skins to transform characters into Mario, Luigi, Peach, Bowser, Captain Toad, and Waluigi among others, world and item textures that will let you block out your world Mushroom Kingdom, and 15 music tracks from Super Mario 64. But, the pièce de résistance is the pre-created Super Mario themed world that you can explore. It’s the perfect Blue Peter moment, 4J Studios free to mutter “Here’s one I made earlier!” You could spend hours exploring this jaw-dropping world, that has seen the developer recreate Peach’s Castle, Bowser’s Airship, and Delfino Plaza, as well as towering characters such as King Bob-omb, Petey Piranha, and Yoshi that dwarf the player. Whether a source of inspiration or not, it easily demonstrates the breadth and scale of what players can similarly achieve. 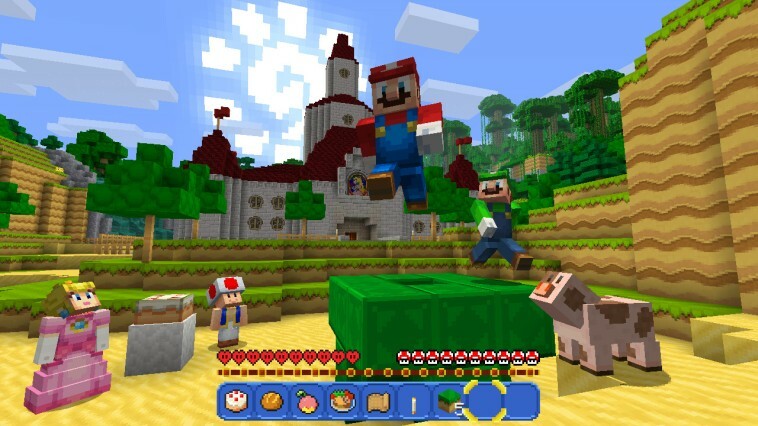 There’s even the chance to transfer the save files that you have created in Minecraft: Wii U Edition to Minecraft: Nintendo Switch Edition over a local network, while exciting news that’s come down the warp pipe is the Better Together Update. This will introduce cross-platform play that, while it will require you to have an Xbox Live Account, will soon break down barriers to let people play Minecraft together regardless of which platform they are playing on. 4J Studios has steadily released updates to improve the game since release, most notably introducing 1080p support when playing in TV mode. And, with playful concepts such as the Battle, Tumble, and Glide Mini Games presenting new ways to enjoy and interact with the Minecraft universe, there has never been a better time to see what the creative sandbox is all about. Minecraft: Nintendo Switch Edition presents yet another chance to discover gaming’s greatest blank canvas, and, with the freedom to play both at home and on the go, it easily ranks as the best portable version that money can buy.